**New Design** The rings in the noseknots are now smaller. The ring in the fiador knot remains at the same size. Please note that if choosing brass rings then the noseknot rings are the same size as the ring in the fiador knot. This is for the bridle/halter combo only.Reins are available separately. Made from top quality doublebraid yachting rope, this halter is tied with the correct double overhand knots and a fiador knot under the jaw. 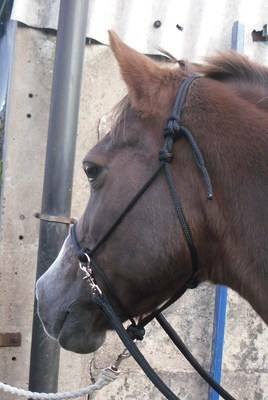 The noseband incorporates steel rings in the nose knots to attach your reins for bitless riding. The fiador knot also incorporates a steel ring. This can also be used to attach your reins to if you prefer. Another option is the reins attached to the nose knot rings with a leadrope clipped into the fiador ring and looped back to your saddle, or hitched around your horse`s neck. This halter/bridle can also be used as a normal halter for all natural horsemanship training by clipping your training line to the ring in the fiador knot. Lots of colours available and reins to match. If you are unsure of the size you need you can contact me for a fast reply.